At least 1,000 people were killed when Hurricane Matthew battered the Tiburon peninsula in Haiti last week, destroying houses and displacing tens of thousands. A humanitarian crisis is now unfolding for the survivors, with the Pan American Health Organization warning of a likely cholera surge in the country due to severely damaged water supply and sanitation systems. Several other Caribbean island states have been affected, including the Dominican Republic, Jamaica, Barbados, Saint Vincent and the Grenadines, and Cuba, as well as the United States. In 2011, one of us (Jason) led a team to Haiti’s capital Port-au-Prince to contribute to the reconstruction effort after the devastating 2010 earthquake. The team worked particularly on the provision of housing. In all interactions, the team encountered a local community that was honourable, industrious and kind. This perception is confirmed by those who have spent time on the ground after Hurricane Matthew. But, as is common in the media and institutional narrative following disasters, prejudices and preconceptions abound. Following the earthquake, the Haitians were portrayed as weak, dependent, corrupt and lawless victims. The international community intervened, amid a global outpouring of grief, support and solidarity. 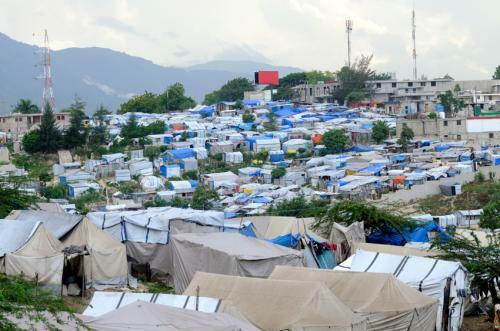 Five years later, destruction and suffering in Haiti is again making headlines. Why is history repeating itself? According to the United Nations Office for Disaster Risk Reduction, disaster risk is a function of hazard, exposure and vulnerability. It is normally expressed as the likelihood of deaths, injury or loss of infrastructure for a specific period of time. This suggests that disasters are the product of the human condition. But other experts describe disasters as “manifestations of unresolved development problems”. Therefore, disasters are not a natural phenomenon. Humans play a central role. As a result, a natural hazard such as Hurricane Matthew impacts each country in its path differently. Countries, regions, people groups and individuals are distinctly affected by hazards, mostly based on pre-existing vulnerability. While most scholars agree that there are particular vulnerabilities for specific hazards, some argue for “a generalised vulnerability that affects the poorest of the poor and most marginal in all parts of the world”. In Haiti, many aspects of risk and vulnerability have very deep roots in colonial history. The structural injustice existing in society has been compounded by recent trends in international economics. These have worked to exacerbate widespread vulnerability and exposure. The earthquake in 2010 resulted in 222,750 deaths, 300,000 injuries, 1.5 million displaced people, and more than 3 million affected in total. Most of the built environment in Port-au-Prince was destroyed, as well as its basic services and infrastructure. In August 2010 the United Nations tacitly admitted blame for the cholera outbreak that occurred after the earthquake. However, it later invoked absolute immunity. Cholera has claimed more than 9,000 lives and infected more than 720,000 people in Haiti since 2010. And the failure to contain and eradicate the disease has manifested into the current crisis, with a surge of infections in the areas hit hardest by Hurricane Matthew due to poor water and sanitation. Little of the US$13.5 billion pledged by the international community after the earthquake ever made it to Haiti’s people or into its economy. Most of it (94%) went to private contractors, donor nations’ own civilian and military entities, international non-government organisations, and UN agencies. Investigations have revealed that the actors of predatory capitalism rushed to secure quick and easy profits in the wake of calamity. This has helped to prevent any serious effort to address disaster risk by sidelining local stakeholders. Under the guise of goodwill and solidarity, the United States has officially supported what journalist Antony Loewenstein calls “the latest incarnation of a tired model that failed to deliver long-lasting benefits to locals, but instead delivered cheap labour to multinationals”. No argument for skills development and employment opportunities can really excuse abusive labour practices. In Haiti, these simply reinforced underlying vulnerability and made a mockery of the commitment to “build back better”. In reality, the United States’ interests have been protected and served in Haiti for a century. …without tackling all vulnerability drivers – that are the roots of [disaster risk creation] – the conditions of [disaster risk creation] will continue to prevail over attempts at [disaster risk reduction]. We continue to demand conformity to orthodox ways of thinking about economics, development, governance and society that have locked us into destructive pathways. Disaster risk is socially-constructed and we must propose solutions that do not ignore root causes. This means providing empowerment and autonomy to communities which live in at-risk areas, including access to resources, education, livelihoods, and health. Hurricane Matthew has disrupted the expected course of events. We should not seek to put Haiti back on course. We need to change course altogether, use disruption to identify another course of action in consultation with Haitians. We know that development, imposed by external forces that exploit the local labour force is not in the interest of the marginalised. A failure to respect human rights, local needs, the environment and human-environment relations simply creates disaster risk. A shift towards truly transparent, democratic and participative practices is necessary. We must acknowledge the role of corporations, governments, NGOs and even United Nations agencies both in creating new risk and preventing the reduction of existing risk. Otherwise our well-meaning efforts to help Haiti now and in the future will leave us asking the same questions when disaster next strikes.